I love the idea of pulling the empty cars through the loader as they are then loaded. But this is just to big a challenge that I really don't want to take the tie to tackle. So then I was thinking a spar loader as you were. But now this idea is easy to build and has that same concept as the McGiffert only not as mobile which for my layout plan wouldn't be necessary anyway. So this is a good thread. Now I have two of your projects to steal. Good deal, yeah, Jerry's model is gorgeous. I am going to make a passed out drunk figure of my brother-in-law and put him on the bench. Which is so NOT the real him. I love how the lantern on the table came out. These are some crazy small LEDs from Lighthouse LED. They are smaller than the head of a sewing pin by at least half. Come pre-wired with a resistor so they will run anywhere from 6v to over 15v. 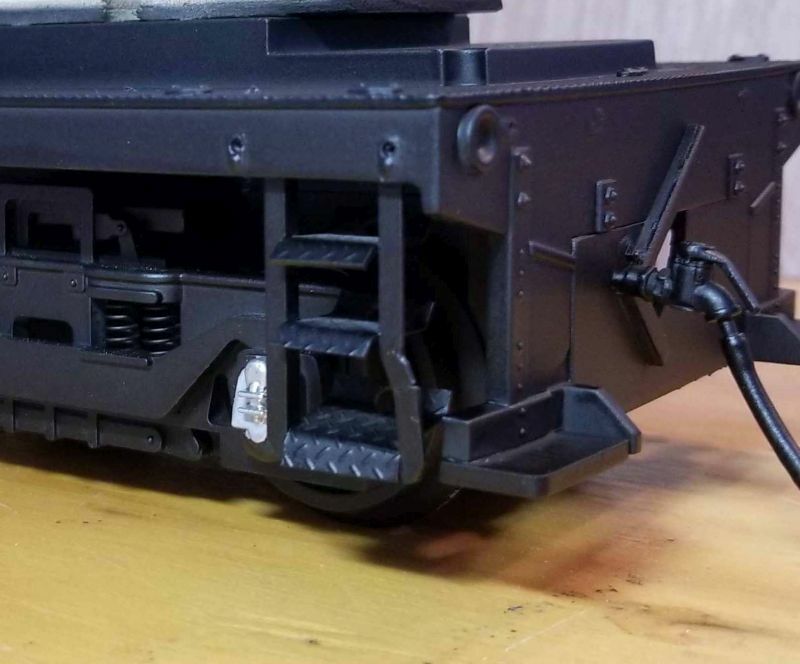 When I get back to the GP9 build I am going to use them for working step lights. Well first off sorry for the deleted pics. I don't know what I did here is were it is and I added back a couple others. So here is the prototype. And here is my rendition so far. And the first of the lights. A lantern that I drilled and put a very itty bitty LED in. I still have some tools to make, add the doors, and a couple interior lights. Those lifting weights at the hook are pretty impressive for a hand winch. Of course ever time you wrap a block you double your lifting/pull capacity. Looks like a heck of a fun project and is historically meaningful. Keep us posted. Not only a 2 man drive system but it looks like a 2 speed winch as well. Correct me if I am wrong but it looks like the handle shaft is made to slide over; it is shown in the gear reduction mode in the picture, if you slide the handles over and lock them in you would be in direct drive to the drum gear. I suppose the change would be for the amount of weight you were trying to lift. For instance a truck would weigh in around 5-6 K, that would take some pretty serious hand cranking. Holed it in one, thanks Rick! Here's a summary of some calcs I did a couple months ago. The thing needed to pick up an end of a typical box car (empty) and set it back on the rails. And in the Whispering Smith movie, that's what it was in the act of doing. That was with the mini steam engine powering it, but before then (when in V&T service) two men could have done it. BTW, I'm not sure what diameter of wire rope was used here, but I've been assuming 1/2" -ish. 10 tons would have been nearing the limit of even modern 1/2" rope, which has a min working force of 10.7-11.5 (depending on the winding). Then there are the limits of bearings, fasteners, cable clamps, etc. Point being, spreadsheets are one thing, reality and common sense is another. I doubt they'd have cranked it to 10 tons. But unfortunately, I haven't found any manufacturer's ratings. 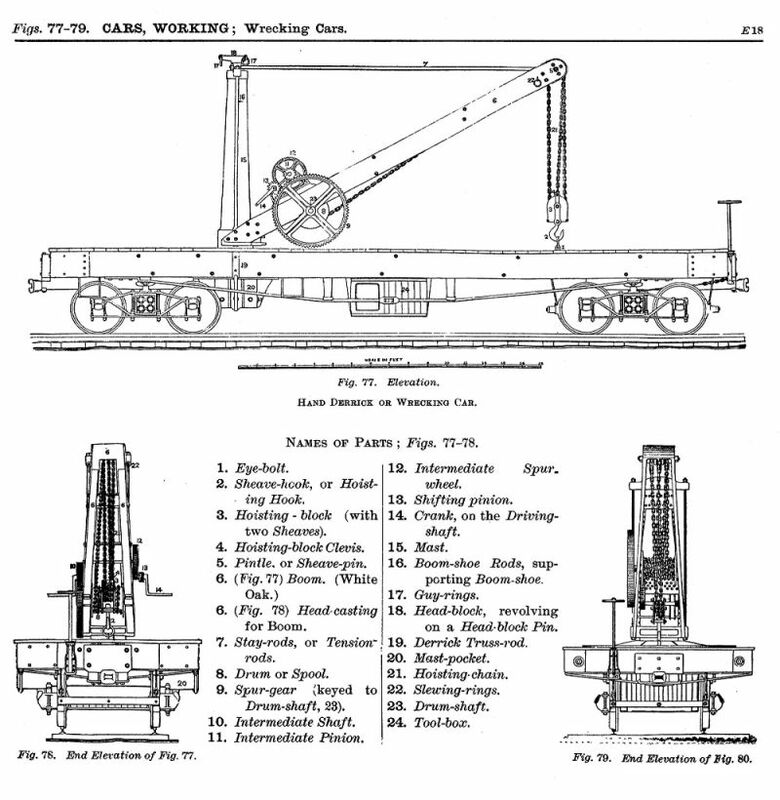 Though the identical mechanism is shown in Fig 77 of Car Builders Dictionary (1888), they don't cite a capacity. If anyone comes across more info, I'd be grateful to have it. I mentioned there were 5 trucks in the project, with four different versions. The truck beneath the mast doesn't have brakes, because there's no room for the rigging down there. So, with and without brakes, standard and narrow gauge. The cosmetic one on the deck is an extra standard gauge, with brakes. Here's what the gauge difference looks like. 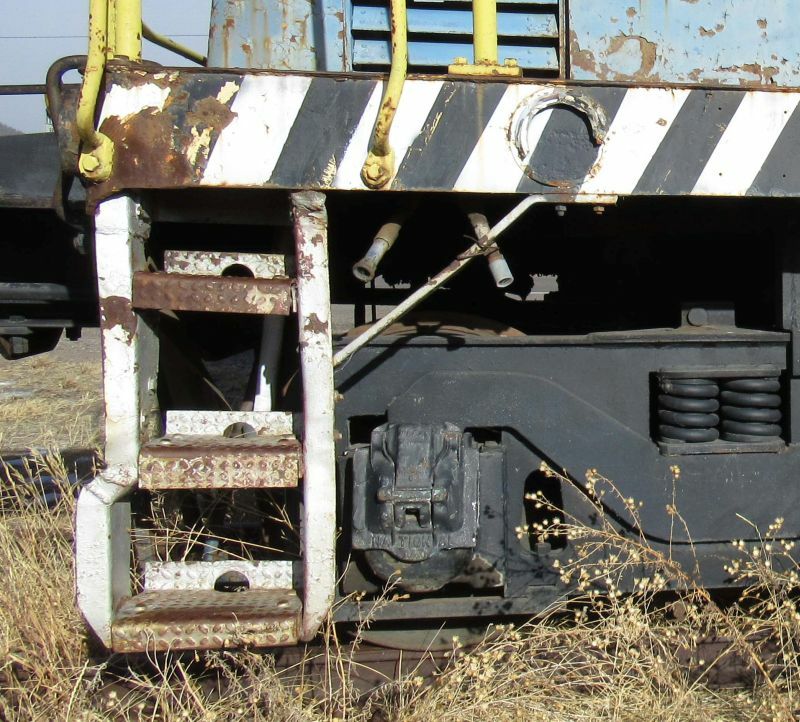 The standard gauge configuration has more realistic body-mounted couplers. I can't use them on my layout (curves are too tight), so these couplers are just for show; they plug into a drawbar socket. The narrow gauge config has typical truck couplers, modeled along a Bachmann design. A blanking plate plugs into the drawbar socket. Chris, thanks brutha, I'll do my best! Jim, Forrest, measuring between coupler ends, it's 20.29" long; length of the deck is 18". About the compression I wanted to avoid, I originally started the project thinking I could use a commercial flat car, say, B'man or LGB, but those are quite shorter. (I'd measure, but I'm in a hotel at the moment... another work trip). Since the mast stabs through the deck, between a truck and the needle beams, there wasn't room for the mast's underside details. Another example is the Bachmann truck frames I was going to use, until more recently. Though supposedly 1:20-ish, their axles were about 1/2" too close together for this 1:24 model. john, it's a hand-operated winch, with a handle on either side (for 2 man op, if needed; or maybe also just for convenience). When the derrick was sold to Paramount for movie work in '47, PM mounted a tiny steam or air motor (powered from the loco) on the boom to drive it. It's shown clearly in the movie Whispering Smith, which has the best (and apparently only) photography of the derrick in actual operation. Here's a detail shot of the model winch. Yellow parts are brass, black is 3d printed; wood is cedar. Cliff Jennings said: ... without the compression rippling though the rest of the model. Haven't seen/heard that exact phrasing before but it definitely transmits the concept well; that is indeed what happens. How are the winches driven? Kewl! How long is this? What are the implications of non-compression? Going to be another good one to watch Cliffy! The trucks were a kinda big deal on this project. After looking at a number of commercial options, including beauts from Iron Creek Shops, I decided to roll my own, using 3D printed parts and wood. I'll go over their construction as I get to them, but for the present, I wanted to point out the gauge and scale problems with this build. I wanted to model on an actual scale, on a model that wasn't compressed. I'm using 1:24 on my "formal" modeling projects; so for this model, that means it's pretty long -- because it isn't compressed, like all the LGB stuff. That's important, because I need the room to fit in the derrick without the compression rippling though the rest of the model. The other problem is gauge. Since I'm doing 1:24 on 45mm gauge, that's narrow gauge. But the V&T was standard gauge. So that means the trucks, if they're to run on my layout, are too narrow for a prototypical model. The solution I found was to make two sets of trucks: one narrow gauge (for running), the other standard gauge (for display / discussion). Well, and one more standard-gauge truck for display, on the deck (as shown), because that's how the ol' #50 was configured in her best (and final) photos. So, five trucks for one car model. The display will be dual-gauge, to support either truck configuration. Thank you for the comments, gentlemen. They're pretty fragile, and if I still owned hundreds of feet of operational track I would fear for their survival. But since I have no track these days, they should be fine. Just the way our software works. Every day for me Just did now 'cause I didn't notice the big red underlines on misspelled words! Good re-use of the radiator louvers. Project is proceeding nicely.